As we stood in our kitchen last week and I started crying, feeling alone in this battle, I asked you…no screamed at you for sleeping through our crisis. I am so ashamed. And I am so sorry. I know you are in this fight with me, but there are so many days when I feel like we are in the same boat, but I am doing all of the rowing while you are enjoying the scenery. Or I am the one on the front lines taking all of the hits and when I turn around to look for you, I see you standing there, just hanging back, cleaning your gun and not worrying about all of the bullets flying through the air. Why is it that you never seem to focus on the heartache and longing for children like I do? Why don’t I ever see you worry about our future of becoming parents? How come you are never frustrated, doubtful, or angry? And if you are, you don’t talk about it, let alone show it. You always seem to be so calm, cool, and collected. It is as if we are in a burning house together and the two of us are running in different directions, bumping and tripping into each other. I’m screaming to hurry and get out, while you stop to make a sandwich and sip on a tall glass of tea. Your sense of peace and nonchalant attitude drives me crazy and sends me into a panic that my faith isn’t where it needs to be. I want to sit and enjoy a sandwich with you, but I can’t. I can’t just “relax” all of the time like you can. I can’t always push the doubtful thoughts out of my mind when they enter. I can’t always ignore the pregnant woman walking through the mall or the perfect family of four sitting at the table across from us at dinner. I can’t. I can’t because I know our inability to have children rests solely on my body’s inability to function correctly. And so I do harbor all of the guilt of depriving you, the man I love, a family. It’s always in the back of my mind how naive we were eight years ago when we talked about when we would start our family and how many children we would have and if they would be involved in this activity or that activity. I sometimes think back to those conversations and wonder how many of your dreams have been put on hold because of me. Because every day you come home from work, I think about how much you might long to hear “Daddy’s home!” as little feet come running to the door to greet you. And it breaks my heart. It also stresses me out because what if I am not doing something that could help our odds of conceiving? What if it’s the foods I am eating, the drinks I am drinking, or the cosmetics and nail polishes I am using? I know all of these are irrational thoughts but I’m not always the best at fighting them off. And so that’s when I need you. I need you to whisper to me each day the “sweet nothings” that affirm we are in this together. I also need you to just hold me on those days when I’m too tired and too worn out to fight anymore. And sugars? On those tough days, I really need you to fight for me…for us. 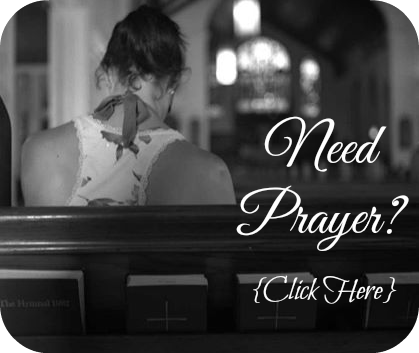 I need you to not only pray for my womb, but tell me when you do. There is just something about knowing that your spouse is fighting not just physically, but spiritually for your family that makes your own hope and faith rise. I also need you to give my hand an extra squeeze as we pass by children on the playground or a pregnant woman walks in to the room glowing, while rubbing her beautiful belly. It may not phase you, but I need you to let me know you understand that for me, it might hurt my heart in that moment. As simple as it sounds, a gentle squeeze of my hand not only let’s me know you are in this with me, but it wakes me up from the trance that I fall into while thinking about all the negative thoughts that will automatically start racing through my mind. I wish these reminders didn’t bother me and I didn’t even notice them like you, but I can’t. And so while I can’t always be the stronger, calmer, relaxed and more patient one, I know that you can. And deep down I know that you aren’t sleeping during this stormy season that we are caught up in. How could you when I know that your desire to have children is just as strong as mine, you just don’t show it like I do. And honestly? I’m thankful you don’t. Because when the wind starts blowing and the trees start swaying from side to side, I know that you will still standing tall. You will still be unshakable. And that is what I need even if it drives me crazy. Because on the days I can’t remain solid in my faith and calm during the storms, I need you there. I need you there when I am paralyzed with fear and unable to open up my umbrella for protection. I need you there with yours, shielding me from the down pour of this rain, this struggle and this fight to build our family. And I need you to let me know through your words and even in your silence, that you are there. And you are ready. I can’t tell you enough how much I love you and how thankful I am that God gave me someone who can, when I can’t. You truly are my rock and I wouldn’t want anyone else holding my umbrella but you. Oh how I needed this today!! I sent my hubby a text letting him know that no, we aren’t pregnant this cycle and that it was most likely anovulatory and that my next appointment is in April because that’s as soon as I could get in… The response I got? I could have killed him! This is awesome, Elisha. I was suffering for many months last year feeling so alone in my journey and wishing I could somehow show my husband what I was feeling. 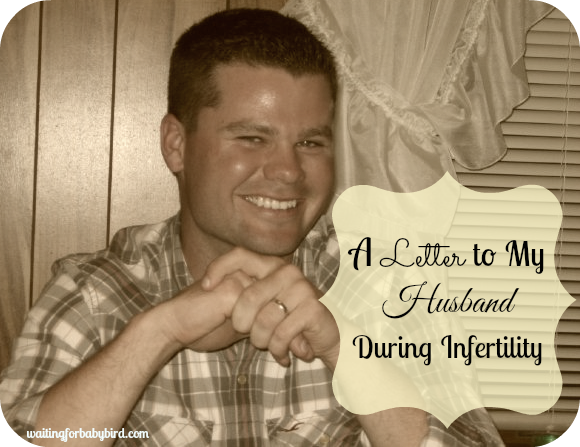 Writing a letter to your husband to tell him what you need is such a great idea. I should also add, my husband is the same way, never doubting God. He always responds, “God will give us a baby someday.” The other week, I said confidently that God was going to give us a child and he responded, “I know! That’s what I’ve always said!” Well, sorrrry Mr. that I struggled to believe it for so long. LOL it really used to drive me nuts! bahaha! I have had those SAME conversations! Thank you for sharing. As I read your entry, all I could hear in my head is “Yeah!” and “That’s how my hubby is”. I know they handle things differently. My husband sounds a lot like yours. Very calm, very patient, and is utterly positive that we will have a family. I believe a lot of it can be in my head. I know God is watching over us and has a plan. Again, thank you for sharing, especially because I’ve felt the same way too…..
Go check out Elisha’s letter to her husband. Raise your hand if it ever feels like your the only person in the marriage freaking out about infertility (BOTH HANDS RAISED!!!) I think we all need to read this because infertility is a tough burden on a married couple and we have to FIGHT for the one we love. We’ve all been through so much, we deserve to have a happy marriage, and I believe with hard work, prayer, and dedication we can all not only survive this time but live through it abundantly. Perfect words. Flawless. L-o-v-e it all! Keep it coming! thanks girl! I just read your post! My hubby’s SA a couple of years ago was “perfect” as well…we got some perfect swimmys! Bahaha. We know how to pick them. But in response to your letter, this makes the guilt heavier bc you know they can – it’s us with the problem. Then the what if’s start flowing. What if you had married someone else? What if it was you and not me? How would I feel then? This is very brave, and I think it is SO important to acknowledge that men and women handle infertility differently. I know I don’t know your hubby “in real life” but I DO know that he loves you very much and he hurts when you hurt. Guys just handle their emotions differently, you know? You two have a solid marriage (even though we all have our rough days) and I know that foundation is built on God. 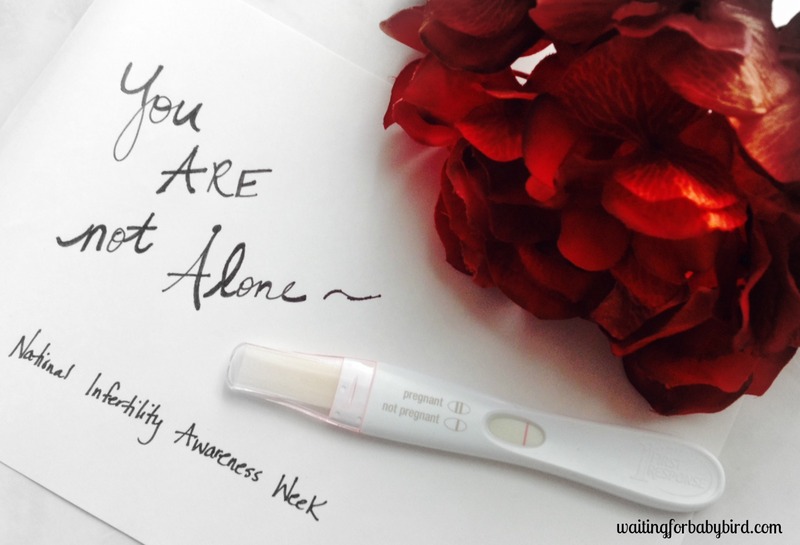 I was wanting to have some kind of “how to support your husband through infertility” series in my blog (especially since my thoughts lately on where I feel it is being led) and this post fits the bill. Guest post sometime? 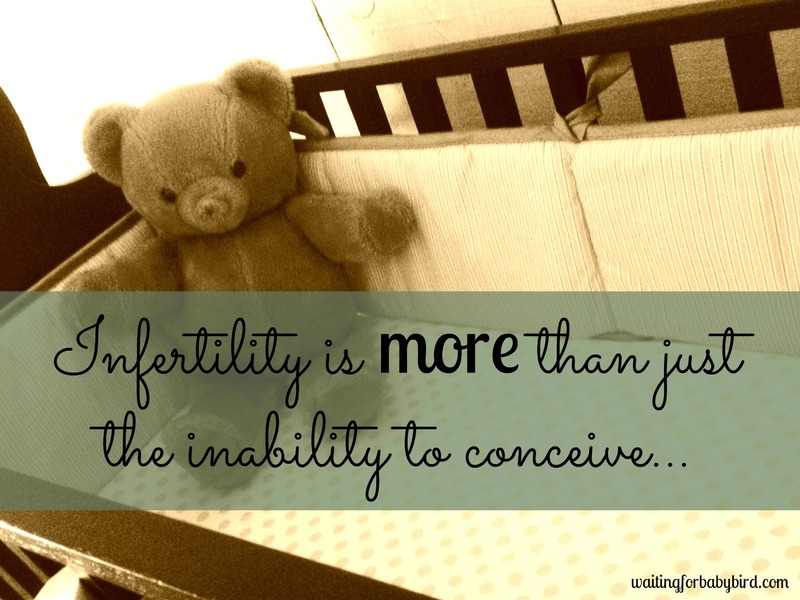 Men definitely handle infertility differently. 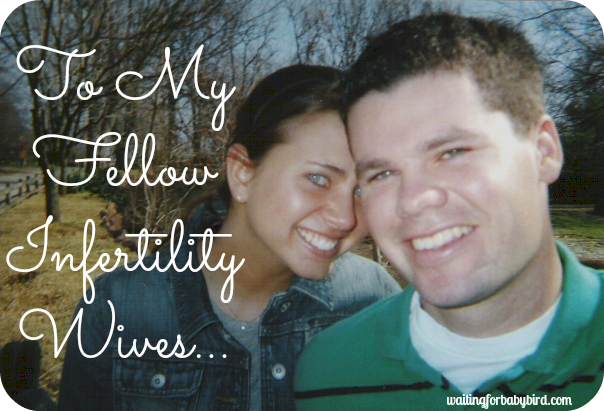 One thing I have learned recently is that I need to ask my husband questions about how he is doing with infertility. While I have a blog, girlfriends, and him to vent to, he doesn’t have an outlet. Men don’t often ask each other how they are feeling. He might not want to talk about it often, but it’s important to give him an opportunity. I have found that he is more concerned about supporting me than in vocalizing his own suffering. So beautiful, Elisha. Perfect. So important for both of us to remember we are on the same team. My hubs is quiet about it,,, but I am a little too. We really don’t talk about it a lot unless it’s the week to bd or after the tww or if we have an appointment. Don’t know if it’s good or bad… But I think it’s ok bc it doesn’t really consume our lives (most days). We’re both pretty busy so if it’s not a forefront issue, it’s pretty quiet. But communication is key!! Love it! Yes!!! This is exactly what I was talking about in my last post about my hubby and I waiting differently. Thank you for being brave enough to share this. It’s so nice to know I’m not alone in having these kinda of thoughts and feelings. Oh Elisha! I would love to hear His reply! Aren’t you glad we are so different in the way we handle things? It would be hard if we reacted the same! I know that this is what so many of your readers needs to hear! Thanks for being transparent and honest! I love how God brought you two together and has you perfectly woven, even in this hard time! wow!! This is EXACTLY how I feel. thank you for sharing. 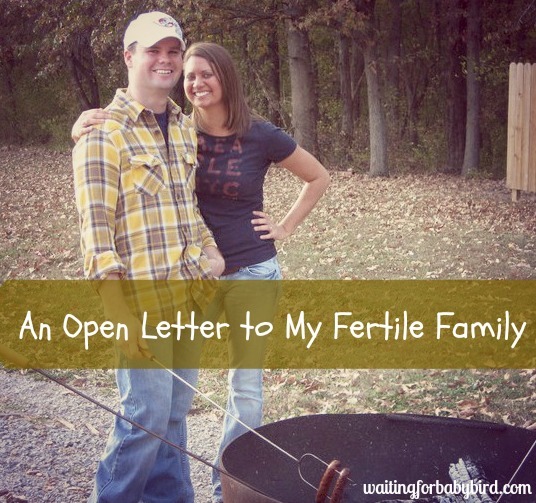 I have found myself getting so frustrated with my husband as I lay in bed bawling over infertility. I know it isn’t his fault, and I know he cares… but sometimes I need a little extra love! Raw honesty is so relatable!! I believe this letter is going to minister to so many. Thanks for being real girl. Thanks for reading. I never want my blog to be all airy and fluffy all the time… Life isn’t like that. Readers need to know they aren’t alone in their feelings. I love your blogs by the way! This is a beautiful letter and really spoke to me. So much of it rang true for me. Thank you for sharing such a personal letter. Thank you! You are in my prayers girlie!! So brave of you to post this, and it so spot on. This is something I struggled with SO MUCH when we were going through treatments, and it’s something that Satan could so easily use to separate a couple, and make them feel isolated from one another. My husband is incredibly laid back… frustratingly so sometimes, but it sure is a quality I admire! Praying for both of you! Yes it is a wonderful quality to have…now I just need him to transmit it to me and not bottle it all up for himself. lol!! Love ya girl!!!! This is absolutely beautiful. I think you have plucked thoughts out of every woman’s brain because we have all felt like this, I’m sure. You have just put it together and worded it so beautifully. Your husband is a lucky man to have you!!! Ok. So it must be a husband thing. As I was reading this, I kept thinking, “Yep. That’s my husband. Yep. He does that too. Yep. I’ve felt that way before.” Thank you for sharing this. You are on my mind and in my prayers! This is so good to read as I feel so much like this too often. Thanks so much for sharing! You took the words right out of my mouth. You’re not alone. Loved reading this post :). So glad I am not alone. Thank you for reading! This is such a great post. I just had the same conversation with my hubby a few days ago and it was hard!! I didn’t want to hurt him, but needed him to understand how hard this is for me and how I perceive things he does. Seriously, you have no idea how comforting it is to know other people go through this relationship stuff in the same way too. Thanks. i am so glad I decided to post this! I just knew other women could relate. It’s okay to feel this way and it’s okay for them to feel the way they do…but it’s not okay for each of us to not communicate to what we need. When communication stops then so does the marriage I’m determined to not let infertility put a strain on my marriage. Thanks so much for reading! hugs!!! I think we all feel that way and they all behave that way. Bill says he feels like he has to be strong for me, but it can make you crazy. Especially when you are frustrated. Beautifully written. Thanks for sharing. Sending prayers right back at you. Oh man. Amen to all of that, sister. I can relate 10000000%!!! Right there with you! Marc is always so easy going and when I am an emotional basket case, it aggravates me so much. He says he is being strong for us, but I so wish sometimes, he would just melt into emotional mush with me. Wouldn’t make me feel so alone. Thanks for sharing your heart dear. Wow, how brave of you to share this with us! You are certainly blessed with a husband who is with you and loves you through everything! You tell the enemy to back off! You’re in my prayers! Thank you for sharing this! I often feel exactly the same way and it’s exhausting feeling like your towing the line alone (even though in your heart you know they are there). It continues to amaze me how two people, going through the same battle, can experience it so very differently. When ours first began my hubby and I were not on the same page. He felt helpless and didn’t really understand why a negative HPT was so upsetting to me. He wasn’t mean about it, he just didn’t understand. I was struggling so badly. He finally started to ask me “What do you need from me right now?” and through that we’ve come to a pretty good understanding. He’s much more intune with me now, although sometimes he still finds himself caught in the whirlwind and not understanding what upset me. It’s just so different for each person. This is a beautiful letter and your comments are insightful! Ok, I am definitely tearing up here. Read every word, and you are right…so many women can relate. I used to feel this same way during the first maybe 1.5 years of infertility treatments. On one hand, I wanted hubby to be just as frustrated, pissed off, and sad as me. But on the other hand, what a mess that would have been if we were both such a mess! It wasn’t until my hubby started going to every RE apt. 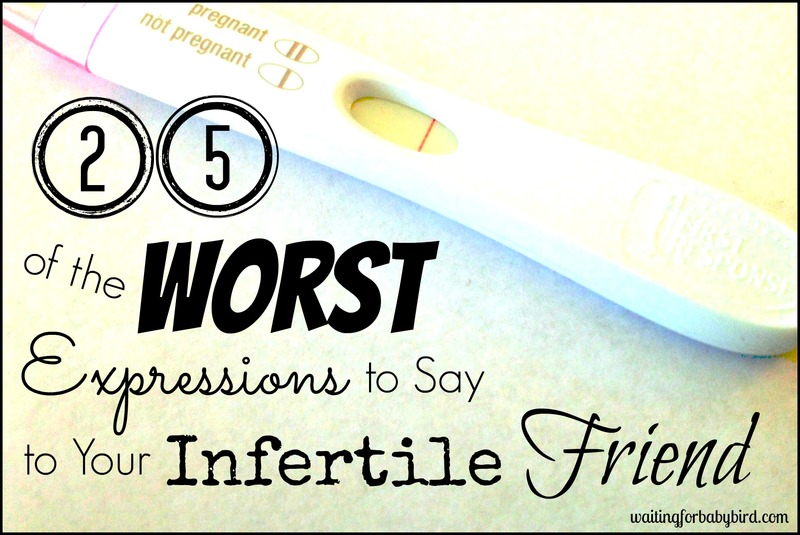 and we had a couple failed IUI’s and IVF’s that I felt my husband could truly relate to my frustrations. He so gets it now. Anyway, I want to thank you for sharing such raw and honest emotions, because most all of us have felt this way, and you worded your letter beautifully! This really spoke to me! 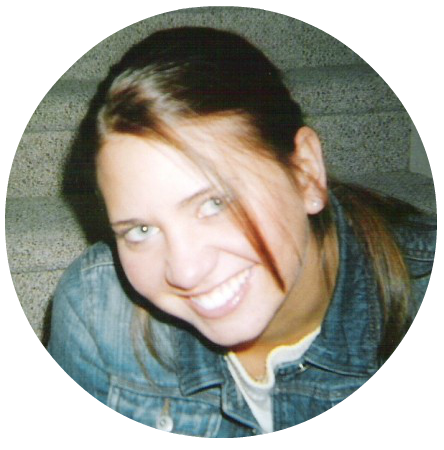 I have had times where I was bawling and hurting and though my husband would hold me, he seemed unaffected. I remember saying “aren’t you upset? Don’t you ever get sad? Why aren’t you more sad?” and he says he is, but he just doesn’t show it in that way. It is amazing how much it helps when you see a pregnant woman or a cute child and your husband just gives you a look that says he knows you’re hurting. Just to acknowledge it makes all the difference. exactly!! My hubby said he doesn’t even think to look over at me because he doesn’t hurt when he see’s them. And to be honest, I don’t always notice the prego lady across from me, but when I do, I need to know that he is ready to pick up the pieces later. I think he is starting to get it. 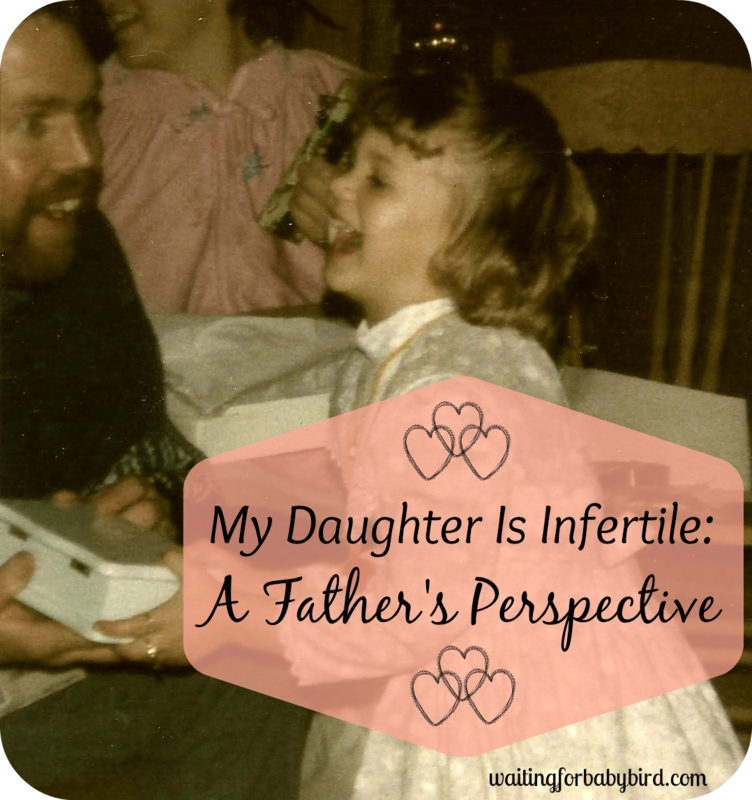 Last week i was overwhelmed about a few things (non fertility related) and i busted into tears at the dinner table. He put down his fork and walked over and hugged me. I stopped crying and we went to eating. I guess my tears weren’t over because in between bites I busted into tears again. He put down his fork and came over again. It made me laugh. He is finally getting it. lol!! Yes. That is exactly how I feel, running around like crazy while he’s making a sandwich, no big deal. And I tell him and tell him, and it only works for a couple of days. All this time, and I still feel like I have to deal with this alone. Now I feel like I’m just weirdly dumping this all out on your page when we’ve just ‘met’, but thank you for sharing this post. Beautiful and so glad you wrote this and shared it! It’s so true, for so many of us. It always amazes me how very differently men and women can experience the same situation. My hubby and I really had issues understanding each other at first, and finally we got to the point where we would ask “What do you need from me right now?”. It really helped us navigate each others emotions, because we deal so differently with what’s going on! Thanks so much for sharing! What a beautiful post! Girl this totally made me cry. I am already a hormonal wreck. I am so thankful for my hubby even though we are completely different and he handles it all so differently than I do. Lord knows its for the best because two crazies in the marriage and infertility journey would have done us more harm than good. Thank you for always being so honest seriously….this wrecked me today. This is exact how I’ve felt the past day and a half. As soon as I read your post today I thought of my own post. That’s when I knew I had to start following you. I know how ya feel girlie! Thanks I appreciate that! For us we have also just moved to a new state recently so I feel so isolated that it makes the emotion more painful when you can’t sit down with a good friend or family member you can only hear their voice. I appreciate that sometimes it’s hard to relate and tough to talk about. It took me two days to get through this post…..tears welled up in my eyes too much to be able to get through it all in one sitting. Thank you for sharing! I absolutely adore and love your page, and cannot wait to follow it daily! What a beautiful letter. Men do suffer but sometimes in their desire to remain strong they forget to communicate their suffering…. I think this is perfect. I think it describes me love…I get discouraged yet he has the room planned out. I’m 38…38 and trying for years…God is of the impossible and He believe so.